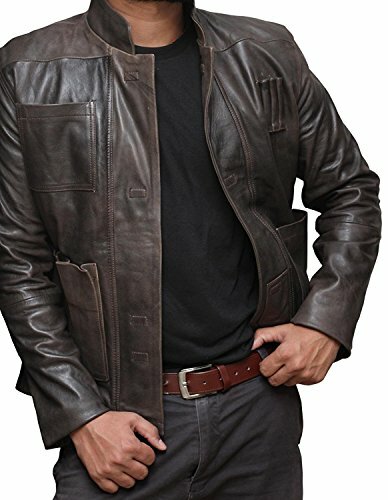 Making you look dashing and groovy than anyone else, this classic leather jacket is an attire that enjoys the association with one of the renowned fictional characters from hugely anticipated Star Wars franchise. The infamous English star Harrison Ford while performing the character of Han Solo spotted donning this appealing jacket. To award your personality the similar timeless style and classic look, we have recreated this brown leather jacket that gonna take your figure sky high in the World of fashion. ► This Han Solo jacket is detailed with elegant features including unique magnetic front strap fastening with zip closure and 3 bullet emblems to make you feel just magnanimous with it. ► Excellent Customer Service & After Sale Support!! !